In the summer of 1845, John Shields, a fellow resident of the boarding house at which Buck was staying, ran afoul of the historian – and paid the price. 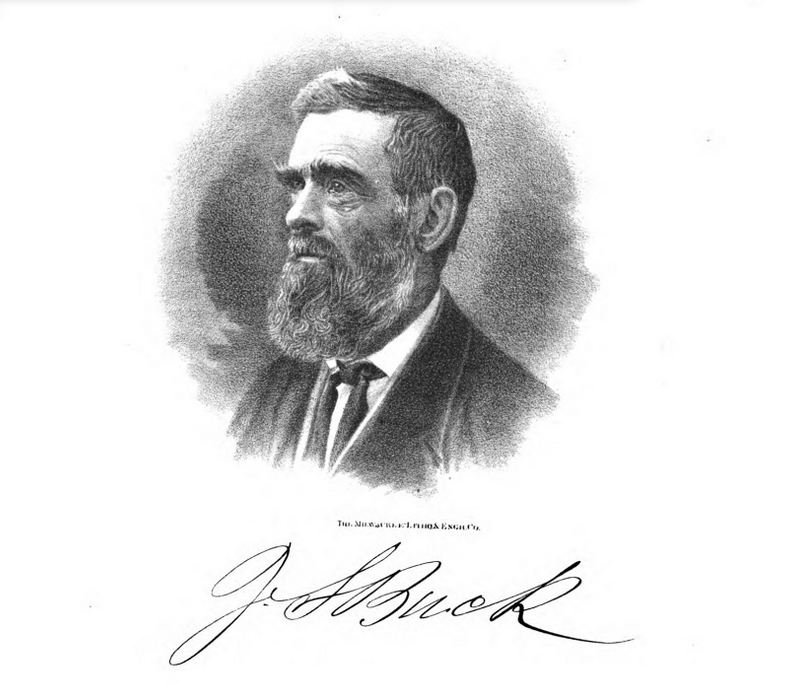 James S. Buck, early settler and inventor of the most powerful cocktail in Milwaukee history. “It happened that John, who was an inveterate drinker and a nuisance generally, was in the habit of coming into my room and bothering me with his senseless twaddle until the thing got to be unbearable,” Buck wrote. He filled a flask and placed it on the floor of his room where a visitor was sure to see it. Sure enough, the following Sunday, Shields stopped in for a visit and, presumably, to deliver another tedious monologue, when his eye fell upon the bottle. He did not wait for a second invitation, but seized the coveted treasure, pulled the cork, inserted the nozzle into his capacious mouth and poured nearly half the contents down his gullet before you could count six. By that time he discovered that it was not ice water, and with a desperate effort to conceal his disappointment, he replaced the cork, deposited the flask upon the floor and without waiting to answer my kind inquiries as to the quality of the fluid, he started down stairs taking four or five steps at a leap, his mouth wide open like the door of a coal stove, and as red as rooster’s comb, while from that, as well as his eyes, the water was running in streams. He broke for an artesian well that stood near, and commenced taking in water like an engine fighting a fire. He must have drank a barrel, stopping at intervals to catch his breath and give vent to his feelings. For weeks afterward, Shields limited his drinking to water while he treated his scorched mouth with borax. Milwaukee Firewater – Ridding the Beer City of unwanted house guests since 1845. Buck reported another incident where a man drank something with unexpected results. Please share that story sometime. I get the impression there may have been a lot of drinking in Milwaukee’s early years!